The major cold fronts in northern Arizona have significantly impacted the fishing conditions. Rim Country anglers have been fortunate to have had stable weather conditions which allowed them to enjoy excellent fishing longer this year. Their luck ran out when the cold fronts and wildly swinging barometric pressures arrived a few weeks ago. In addition, the water temperature in Roosevelt Lake is in the high 50s in the morning. This is significant since the metabolism of fish begins to slow when water temperatures reach 55 degrees. As the water temperature falls farther, the activities of cold-blooded fish such as bass and crappie will slow down even more. Fishing for every species of sport-fish in Rim Country has been dramatically impacted over the past few weeks. Bass and crappie have moved to deeper depths and even trout, which thrive in colder water temperatures, seem to be reacting to the daily changing weather and water conditions. Anglers are reporting poor to fair fishing conditions for most of the streams and lakes. The water level in Roosevelt Lake remains at 39% full. The Salt River and the Tonto Creek flows rates have increased due to the recent storms, adding moisture to the watershed. In addition, some snow has fallen on the Rim and Mazatzal Mountains which is key to long term water supplies into the Salt River chain lakes. Anglers are reporting the best success on casting spoons fished in 30-40 foot depths. Crankbaits, chatter-baits and lipless crank-baits that run in the 25 foot depth range were also reported successful. Experienced anglers know that on sunny days when the shallow areas of coves heat up even slightly, bass will move into those areas in the late afternoon. It’s always a good idea to check the shallow areas. AZGFD preparing to deploy artificial habitat into Roosevelt Lake. 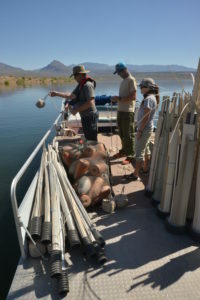 The Roosevelt Lake artificial habitat sites and locations have been updated by the AZGFD at fishaz.azgfd.com. Anglers and the Wildlife Aquatics Branch representatives are reporting huge success of the habitat. Anglers are using fishing graphs to record the GPS locations. AZGFD is in the process of determining which type of structure is best suited for Roosevelt Lake conditions. Trout fishing on all Rim lakes is also slowing, although anglers are still reporting some good days of fishing. Overall fishing conditions are being called fair for most of the Rim Lakes. Freezing temperatures on some of the Rim lakes is now common and a few lakes have a thin ice layer in the mornings. Anglers considering heading to any of the lakes on the Rim are advised to call a local bait or sporting store in the area to check road and lake conditions.